Welcome to the Hilton Branson Convention Center a full-service hotel connected to the Branson Convention Center in the heart of Historic Downtown Branson Missouri. The hotel is located across from the Hilton Promenade and the new Branson Landing retail and entertainment district situated on Lake Taneycomo. We are minutes from the area*s 49 theatres outlet malls golf courses Table Rock Lake Silver Dollar City Celebration City and numerous attractions. Our hotel in Missouri has 294 guest rooms suites and condos in a 12-story glass tower. The guest rooms will serve your needs whether you are in town for business or leisure. You will have a great night*s sleep on our Hilton Serenity Bed package. 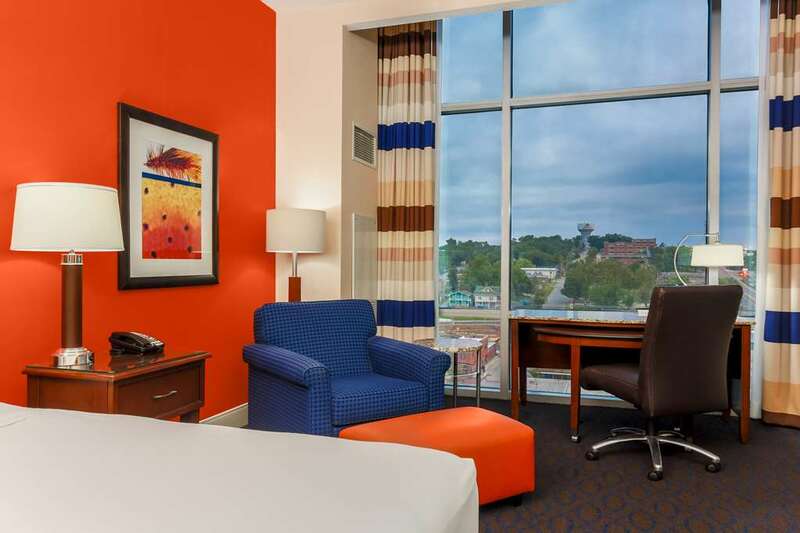 Room amenities include spacious workstations with granite counter tops and ergonomic desk chairs 32-inch LCD flat panel televisions the Hilton clock radio with MP3 adapter two dual-line phones wired and wireless high-speed Internet access and much more. Hotel Features Fitness center featuring a wide assortment of Precor equipment including a variety of cardio theatre equipment free weights and machines. Relax in our indoor pool complete with hot tub or visit our outdoor pool. The perfect way to relax after a long day at the Convention Center or after touring many of Branson Missouri*s attractions. Our 24-hour business center is equipped with computer workstations copier and fax machine for your convenience. Wireless high-speed Internet in guest rooms and meeting rooms. 220 000 square feet of flexible meeting space including 17 meeting rooms and 2 exhibit halls. The Payne Stewart Golf Course is now open for your enjoyment. Only 3 miles from our hotel you can enjoy 18 holes of golf while walking in the footsteps of the great Payne Stewart. Whether your stay at the Hilton Branson Convention Center hotel involves business or pleasure our friendly and courteous hotel staff looks forward to welcoming you to Branson. Travel should take you places. Pool Bar: Open Tuesday - Saturday 12-PM. Other days and times vary based on occupancy. In Room Dining: Our In Room Dining offers menu selection from Level 2.